Summary: Have you ever come across USB drive detected but not accessible problem? If ‘Yes’ then do not worry about it, just like I have provided solutions on how to fix/remove “Read Only” error of USB, SD card & hard drive – similarly, in this post, I am providing very effective solutions on how to fix USB drive detected but not accessible issue on Windows and Mac. Just go through the solutions mentioned below. But before you proceed further to fix not accessible USB drive, you must first use USB drive data recovery software, to recover and keep backup of files – just to avoid data loss. Retrieve photos, videos and audio files from inaccessible USB drive. 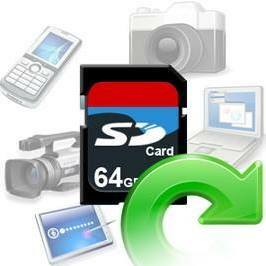 Also restore digital media files from inaccessible SD card, flash drive, & external hard disk. Preview recoverable files within the software before final recovery. 100% read-only program, safe, risk free and secure to use. Alright coming back to the topic, let’s start with real user scenario! USB detected but not accessible. I’m having a problem where whenever I connect one of my USB drives and go to This PC, this shows up. It plays the sound effect for when you plug something in and everything. This only happens with one of my drives, my other two work just fine (but AutoPlay doesn’t work for any of them, can’t figure that out either). I’m not sure why this is happening, yesterday the same drive worked fine. I’ve read that I should change the drive letter, but I can’t because this is what shows up in disk management. Help would be greatly appreciated. 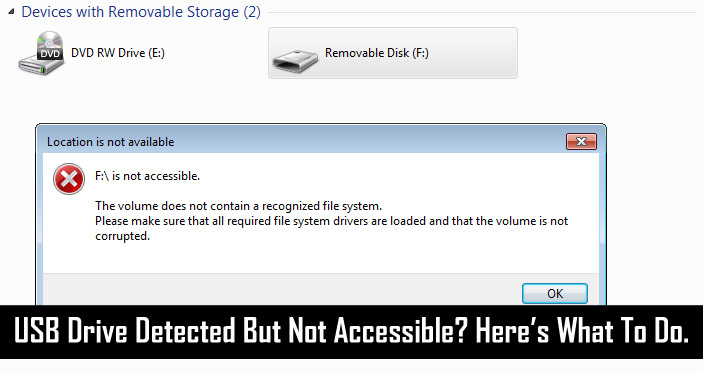 USB drive detected but not accessible is common problem particularly with new USB drive. However, you may also encounter the same issue with external storage devices such as hard drives, memory cards, pen drives, memory stick or flash drives. Due to this problem, whenever we connect external storage device with PC, it gets detected easily, but it doesn’t allow us to access files or data stored within it. Fortunately, this problem can be solved by following below solutions. It is suggested that you must follow the solution one by one and check if your problem is fixed or not. So, if you are encountering the same issue in which your USB drive is detected but not showing or inaccessible in “My Computer”, then you can follow below-mentioned troubleshooting to fix this issue on Windows 10/8/7. Before, you try any other technical solution, you must first check the USB port on your computer. Try to plug your USB in another USB port of your PC – if it works on another port then, the first USB port might be dead. If you are using a USB hub, then connect the drive directly and see if it is working or not – it is because some of the USB hubs are not able to provide enough power supply to function external drive. If still, the drive doesn’t show up in “My Computer”, then connect it to another PC’s USB port, just to check whether the drive itself has got bad or corrupt or your PC has certain problems. You must check your drive appear in the computer’s Disk Management window. If it does not show up then you might be using a dead drive that needs replacement. When you say USB detected but not accessible, then does it means that drive not allowing to access data stored within it or the drive detected but it is not showing up in My Computer. When you said USB detected but not accessible, do you mean the pen drive not showing data or the pen drive detected but not showing in My Computer? If this is the case that your USB is recognized by computer, but you are not able to open files and folders stored within it, then it is recommended that you must use USB Drive Data Recovery famous as photo recovery software. It is capable enough to restore inaccessible files from USB, external hard drive, memory cards that gets detected but not accessible. 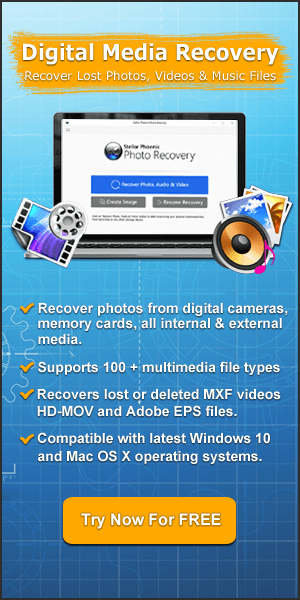 This Digital Media Recovery tool, will help you to restore almost all files format of photos, videos and audio. This also restore files from write protected USB, locked memory cards, virus infected and corrupted USB flash drive. So, download this USB drive recovery software and get back inaccessible data. Additional Reading: How To Recover RAW USB Drive Data on Windows/Mac? This is what you should do, if your drive is detected but not showing in My Computer. Check if it appears in Disk Management. To open Disk Management, click Start and type diskmgmt.msc in the search bar and hit ENTER. Now, Disk Management will get open, here you can check whether your USB is showing up or not. 3. Does your USB drive show up in Disk Management? If your USB appear in Disk Management but it is not accessible, then it means that drive got corrupted or there is error in the disk. Click Start> type msc in search bar and hit ENTER. This will open Computer Management. Now click on “Disk Management” located on the left hand menu. In the Disk Management option, you can see the list of hard drive, this will also display your USB drive. 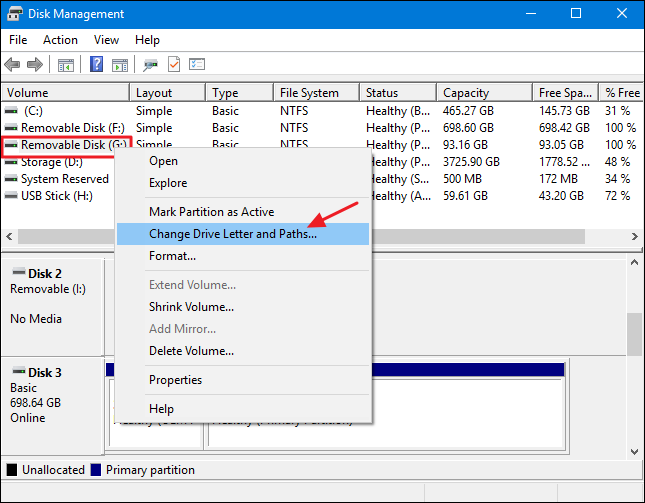 Now right click on your USB drive and select “Change Drive letter and paths”. A small window will pop-up. 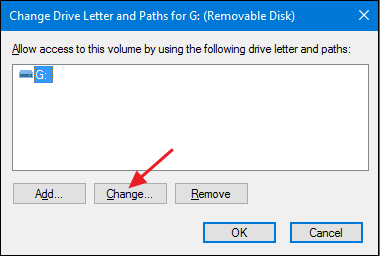 Click on “change” and assign a new drive letter name to your USB. Always remember that you must assign the name which is not being used by any other drive. Once drive letter name changed, your USB drive will show up in My Computer and you will able to access data from it. If not then reboot your system and then check. In major cases, this solution have seems to work great. However, if your USB does not appear even after following the above steps then it is suggested that you must use USB drive file recovery software as mentioned above to recover files from USB drive and after recovery you can proceed further to format or repair the drive. If your USB drive is detected but it doesn’t appear in Disk Management, then you can need to update the driver software. Below follow the steps to do this. 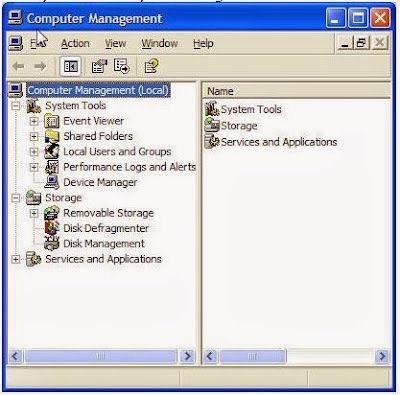 Go to “My Computer” and click on “System Properties” and then on Device Manager located on left pane. You will see a yellow exclamation mark. Right click and select “update driver software” and choose “automatically search for driver software online“. Simply wait and let driver to get installed on your PC. Once driver get installed, reboot your computer and then reconnect your USB and see whether you are able to access files stored within it. Now let’s know the solutions on how to fix USB drive detected but not accessible on Mac. You can make use of Disk utility feature to fix USB drive detected but not accessible on Mac. Open Disk Utility by opening Spotlight (cmd+space-bar) and type Disk Utility and hit ENTER. Search in the list on the left and see if the USB drive appears there. If there is USB drive in Disk utility, then check underneath for a Volume. If it is available there, then click on it and select Mount. If your Mac has already mounted it then you will see unmount option instead. If Volume is not listed there, then it means that your Mac is not able to access drive. You will see that Mount option is greyed out. Here you will have three options – First Aid, Erase and Restore. Click on “First Aid” option to check for errors and then repair the drive if required. If first aid detects any errors, then you can easily fix it by yourself by clicking on “Repair Disk” option. If your Mac not able to repair the drive then it is likely that your USB drive is completely damaged or broken or drive is formatted using a file system that Mac cannot read. 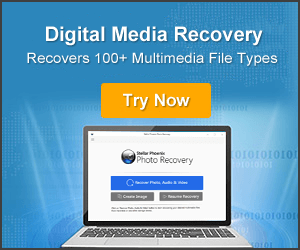 If you want to restore data from USB drive such as pictures, videos or audio files, then you can use Photo Recovery software which is a suitable USB drive data Recovery for Mac. But, if you do not want to restore data then you can simply click on Erase option to erase all data and your Mac will reformat your USB drive. Some people also ask – how to fix flash drive not showing up on Mac? Below find out the solution! Check your Mac is set to show mounted flash drive on the desktop. 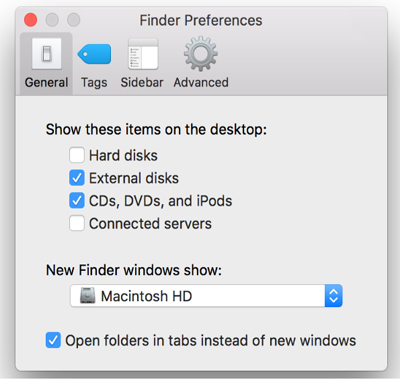 Open Finder > Preferences > General and see that there is a tick beside external drive. If it is not ticked mark then tick mark it. Make sure the flash drive is connected properly on your Mac. Also make sure that USB port is working and not damaged. Try plugging the drive to another USB port. If you have only one port, then plug another device and see if it works fine. Try to connect your drive to another Mac and see if you are able to access the drive on that Mac. So, by now I hope you were able to fix the problem – USB drive is detected but not accessible. And you have also known that you can use USB drive data recovery software if in case you want to restore your important data from inaccessible USB drive. Things To Do To Fix USB Drive Detected But Not Accessible on Windows and Mac. Check USB Port. Does your USB drive appears in My Computer. Does your USB drive show up in Disk Management? Run Computer Management to fix issue. Use Disk Utility To Fix USB Drive Detected But Not Accessible on Mac.